A rally in western Massachusetts on March 20 united customers, local leaders, teachers, and community members in support of Stop & Shop workers in the push for a new contract that honors the hard-working women and men who have made the grocery chain one of the most successful in the country. Hundreds of members of Local 1459 helped lead the rally outside of the Stop & Shop store in Chicopee, Mass. They were joined by Springfield City Council Member Jesse Lederman, a representative from the office of Senator Eric Lesser, and members of the Massachusetts AFL-CIO, SEIU and Jobs With Justice. UFCW Local 1459, along UFCW Locals 371, 328, 919 and 1445, have been united in working to secure a new contract with Stop & Shop that invests in workers and strengthens our commitment to delivering the very best service to the communities we serve. Negotiations began on January 14. Together, all five locals represent over 31,000 Stop & Shop workers. 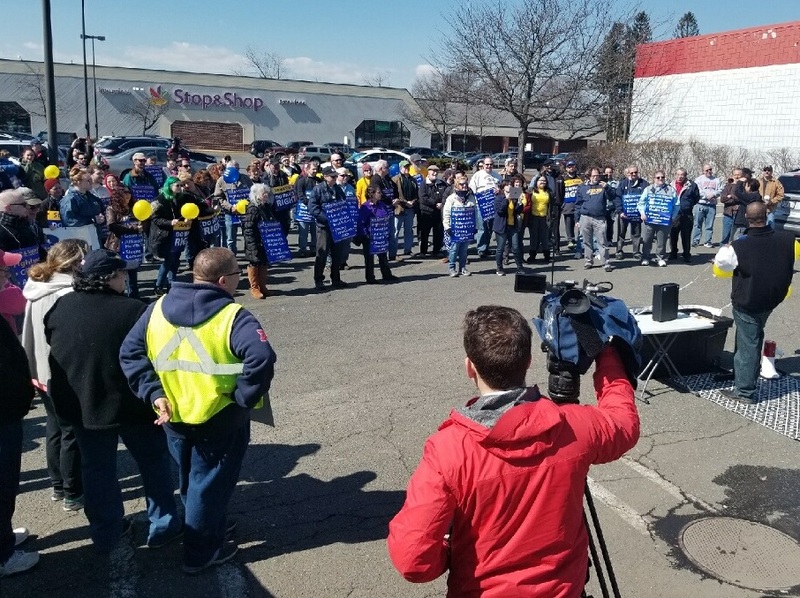 Jobs With Justice and other community allies held another rally in support of Stop & Shop workers in Somerville, Mass., on March 23. UFCW International President Marc Perrone issued a statement on March 6 in response to news that Whole Foods cut workers’ hours after its parent company, Amazon, enacted a wage increase for employees.